Kew Green is Kew's old village green, and it very much still feels like a village green these days. It's surrounded by Georgian houses and nice pubs, and it has a pretty church and a cricket pitch. From 15:00 to 17:00, St Anne's is serving Summer Teas in the church hall. 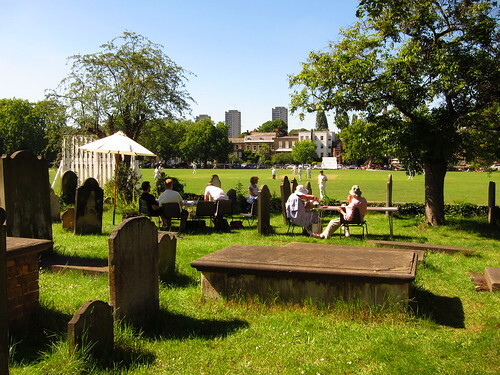 You can sit in the old churchyard among the gravestones, enjoy a cup of tea and a piece of cake, and watch the cricket match on the Green. Kew Green is about ten minutes' walk from Kew Bridge and Kew Gardens stations, from where the 391 bus will also take you there.